For my freshman year science, I took a biweekly chemistry course taught by Paola Seidel. 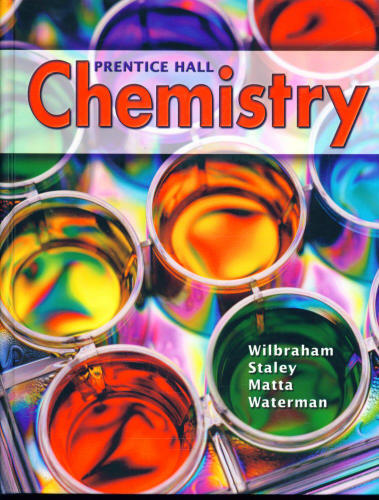 For this class we used the Prentice Hall Chemistry textbook by Wilbraham, Staley, Matta, and Waterman. The class ran through both semesters. Between each class we had to read and take notes on either one or two chapters. Also, as part of our assignments we all answered the assessment questions at the end of each section and the questions in the extensive chapter assessments. In class, Paola would expand on the concepts we learned from the text and help answer any questions we had about the material. She would also have us as a group work through additional problems in class. There were often small labs we would complete in class that had relevance to the topic we were currently studying. By thoroughly reviewing the textbook, completing the assignments, and participating in class, I gained proficient knowledge of high school level chemistry. The first nine chapters introduced me to the conceptual nature of chemistry, from which I learned about atomic structure, periodic trends, bonding, and general reactions, among other things. This general knowledge prepared me to learn the more rigorous mathematical models and concepts in later chapters, such as the behavior of gases, thermochemistry, reaction rates, oxidation/reduction reactions, and nuclear chemistry.